"Voroshilov" redirects here. For other uses, see Voroshilov (disambiguation). This article is about the Soviet military officer and politician. For the Soviet tank series named after him, see KV tank. Voroshilov in his office. Portrait by Isaak Brodsky. Kliment Yefremovich Voroshilov (Russian: Климе́нт Ефре́мович Вороши́лов​ (help·info), Kliment Jefremovič Vorošilov; Ukrainian: Климент Охрімович Ворошилов, Klyment Okhrimovyč Vorošylov), popularly known as Klim Voroshilov (Russian: Клим Вороши́лов, Klim Vorošilov) (4 February 1881 – 2 December 1969), was a prominent Soviet military officer and politician during the Stalin era. He was one of the original five Marshals of the Soviet Union (the highest military rank of the Soviet Union), along with Chief of the General Staff of the Red Army Alexander Yegorov, and three senior commanders, Vasily Blyukher, Semyon Budyonny, and Mikhail Tukhachevsky. Voroshilov was born in the settlement of Verkhnyeye, Bakhmut uyezd, Yekaterinoslav Governorate, Russian Empire (now part of Lysychansk city in Luhansk Oblast, Ukraine), into a railway worker's family of Russian ethnicity. According to the Soviet Major General Petro Grigorenko, Voroshilov himself alluded to the heritage of his birth-country, Ukraine, and to the previous family name of Voroshilo. Voroshilov joined the Bolshevik faction of the Russian Social Democratic Labour Party in 1905. Following the Russian Revolution of 1917, Voroshilov became a member of the Ukrainian Council of People's Commissars and Commissar for Internal Affairs along with Vasiliy Averin. He was well known for aiding Joseph Stalin in the Revolutionary Military Council (led by Leon Trotsky), having become closely associated with Stalin during the Red Army's 1918 defense of Tsaritsyn. Voroshilov was active as a commander of the Southern Front during the Russian Civil War and the Polish–Soviet War while with the 1st Cavalry Army. 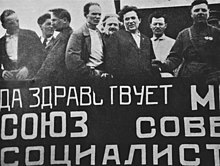 As Political Commissar serving co-equally with Stalin, Voroshilov was responsible for the morale of the 1st Cavalry Army, which was composed chiefly of peasants from southern Russia. Voroshilov headed the Petrograd Police during 1917 and 1918. Voroshilov served as a member of the Central Committee from his election in 1921 until 1961. In 1925, after the death of Mikhail Frunze, Voroshilov was appointed People's Commissar for Military and Navy Affairs and Chairman of the Revolutionary Military Council of the USSR, a post he held until 1934. His main accomplishment in this period was to move key Soviet war industries east of the Urals, so that the Soviet Union could strategically retreat, while keeping its manufacturing capability intact. Frunze's political position adhered to that of the Troika (Grigory Zinoviev, Lev Kamenev, Stalin), but Stalin preferred to have a close, personal ally in charge (as opposed to Frunze, a "Zinovievite"). Frunze was urged by a group of Stalin's hand-picked doctors to have surgery to treat an old stomach ulcer, despite previous doctors recommendations to avoid surgery and Frunze's own unwillingness. He died on the operating table of a massive overdose of chloroform, an anaesthetic. Voroshilov became a full member of the newly formed Politburo in 1926, remaining a member until 1960. Voroshilov was appointed People's Commissar (Minister) for Defence in 1934 and a Marshal of the Soviet Union in 1935. He played a central role in Stalin's Great Purge of the 1930s, denouncing many of his own military colleagues and subordinates when asked to do so by Stalin. He wrote personal letters to exiled former Soviet officers and diplomats such as commissar Mikhail Ostrovsky, asking them to return voluntarily to the Soviet Union and falsely reassuring them that they would not face retribution from authorities. Voroshilov personally signed 185 documented execution lists, fourth among the Soviet leadership after Molotov, Stalin and Kaganovich. During World War II, Voroshilov was a member (1941–1944) of the State Defense Committee. Voroshilov commanded Soviet troops during the Winter War from November 1939 to January 1940 but, due to poor Soviet planning and Voroshilov's incompetence as a general, the Red Army suffered about 185,000 casualties. When the leadership gathered at Stalin's dacha at Kuntsevo, Stalin shouted at Voroshilov for the losses; Voroshilov replied in kind, blaming the failure on Stalin for eliminating the Red Army's best generals in his purges. Voroshilov followed this retort by smashing a platter of roast suckling pig on the table. 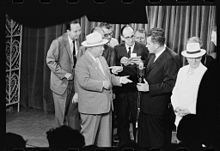 Nikita Khrushchev said it was the only time he ever witnessed such an outburst. Voroshilov was nonetheless made the scapegoat for the initial failures in Finland. He was later replaced as Defense Commissar by Semyon Timoshenko. Voroshilov was then made Deputy Premier responsible for cultural matters. 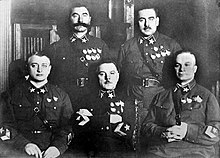 Voroshilov initially argued that thousands of Polish army officers captured in September 1939 should be released, but he later signed the order for their execution in the Katyn massacre of 1940. After the German invasion of the Soviet Union in June 1941, Voroshilov became commander of the short-lived Northwestern Direction (July to August 1941), controlling several fronts. In September 1941 he commanded the Leningrad Front. Working alongside military commander Andrei Zhdanov as German advances threatened to cut off Leningrad, he displayed considerable personal bravery in defiance of heavy shelling at Ivanovskoye; at one point he rallied retreating troops and personally led a counter-attack against German tanks armed only with a pistol. However, the style of counterattack he launched had long since been abandoned by strategists and drew mostly contempt from his military colleagues; he failed to prevent the Germans from surrounding Leningrad and he was dismissed from his post and replaced by the far abler Georgy Zhukov on 8 September 1941. Stalin had a political need for popular wartime leaders, however, and Voroshilov remained as an important figurehead. In an embarrassing incident at the 1943 Tehran Conference, during a ceremony to receive the "Sword of Stalingrad" from Winston Churchill, he took the sword from Stalin but then allowed the sword to fall from its scabbard onto his toes in the presence of the Big Three wartime leaders. Between 1945 and 1947, Voroshilov supervised the establishment of the communist regime in postwar Hungary. He attributed the poor showing of the Hungarian Communist Party in the October 1945 Budapest municipal elections to the number of Jews in leadership positions, arguing that it was ‘detrimental to the party that its leaders are not of Hungarian origin’. In 1952, Voroshilov was appointed a member of the Presidium of the Central Committee. Stalin's death on 5 March 1953 prompted major changes in the Soviet leadership. On 15 March 1953, Voroshilov was approved as Chairman of the Presidium of the Supreme Soviet (i.e., the head of state) with Nikita Khrushchev as First Secretary of the Communist Party and Georgy Malenkov as Premier of the Soviet Union. Voroshilov, Malenkov, and Khrushchev brought about the 26 June 1953 arrest of Lavrenty Beria after Stalin's death. After Khrushchev removed most of the old Stalinists like Molotov and Malenkov from the party, Voroshilov's career began to fade. On 7 May 1960, the Supreme Soviet of the Soviet Union granted Voroshilov's request for retirement and elected Leonid Brezhnev chairman of the Presidium of the Supreme Council (the head of state). The Central Committee also relieved him of duties as a member of the Party Presidium (as the Politburo had been called since 1952) on 16 July 1960. In October 1961, his political defeat was complete at the 22nd party congress when he was excluded from election to the Central Committee. Following Khrushchev's fall from power, Soviet leader Brezhnev brought Voroshilov out of retirement into a figurehead political post. Voroshilov was again re-elected to the Central Committee in 1966. Voroshilov was awarded a second medal of Hero of the Soviet Union 1968. He died in 1969 in Moscow and was buried in the Kremlin Wall Necropolis. The KV series of tanks, used in World War II, was named after Voroshilov. Two towns were also named after him: Voroshilovgrad in Ukraine (now changed back to the historical Luhansk) and Voroshilov in the Soviet Far East (now renamed Ussuriysk after the Ussuri river), as well as the General Staff Academy in Moscow. Stavropol was called Voroshilovsk from 1935 to 1943. Voroshilov was nominated as an honorary citizen of the Turkish town of Izmir in November 1933; in Izmir a street was also named after him. In 1951, it was renamed "Plevne Bulvarı". Voroshilov's grave at the Kremlin Wall Necropolis in Moscow. Voroshilov was married to Ekaterina Voroshilova, born Golda Gorbman, who came from a Jewish Ukrainian family from Mardarovka. She changed her name when she converted to Orthodox Christianity in order to be allowed to marry Voroshilov. They met while both exiled in Arkhangelsk, where Ekaterina was sent in 1906. While both serving on the Tsaritsyn Front in 1918, where Ekaterina was helping orphans, they adopted a four-year-old orphan boy who they named Petya. They also adopted the children of Mikhail Frunze following his death in 1925. During Stalin's rule they lived in the Kremlin at the Horse Guards. His personality as it was described by Molotov in 1974: "Voroshilov was nice, but only in certain times. He always stood for the political line of the party, because he was from a working class, a common man, very good orator. He was clean, yes. And he was personally devoted to Stalin. But his devotion was not very strong. However in this period he advocated Stalin very actively, supported him in everything, though not entirely sure in everything. It also affected their relationship. This is a very complex issue. This must be taken into account to understand why Stalin treated him critically and not invited him at all our conversations. At least at private ones. But he came by himself. Stalin frowned. Under Khrushchev, Voroshilov behaved badly". ^ "Ворошилов Климент Ефремович" (in Russian). Герои Страны (Heroes of the Country). Retrieved 11 March 2018. ^ Darman, Peter (16 December 2012). The Home Fronts: Allied and Axis Life During World War II. Rosen Classroom. p. 26. ISBN 1448892368. ^ a b Erickson, John (4 July 2013). The Soviet High Command: a Military-political History, 1918-1941. Routledge. p. 199. ISBN 1136339523. ^ a b c d Rappaport, Helen (1999). Joseph Stalin: A Biographical Companion. ABC-CLIO. p. 307. ISBN 1576070840. ^ Winston Churchill, Closing the Ring, Vol. 5, p. 321. Wikimedia Commons has media related to Kliment Voroshilov. This page was last edited on 24 April 2019, at 05:10 (UTC).